In Ubuntu, Alt is grabbed by the window manager, so the second alternative tool in the editor can't be accessed. So, we need a different access key here. Maybe ALT GR or MODE would do the trick? Clicking places things, shift+click usually removes it again so those two are straight-forward. 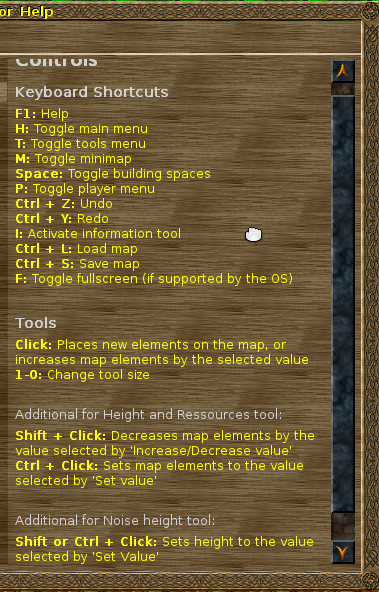 The editor tips includes this little hint: "Holding down ALT switches the second alternative tool on (if it exists)." So presumably, it is not available for all types/tools. Which type(s) is available for, and is it the same functionality offered for all these? I think it will be easier to discuss this if we have a clear idea of what the functionality is supposed to provide and then we can look at how we can achieve this. PS. Off-topic: Not familiar with the MODE key either, is this some alias along the lines of SUPER/windows key? In both cases, they use the "set" value, i.e. instead of increasing or decreasing the current value, it is set to a fixed number. Note that the noise height tool also has a "set" value, but it is invoked by the shift key. If we go away from the first/second alternate tool rule, we might consider to change that behavior (new behavior: shift = opposite; Alt = set). Tools that do not have a second alternate use the first alternate when the Alt key is held down. Do not wonder that the keys behave strangely, that is bug 1418050.
how about we use a(lternative) and s (next to a) for another tool instead of the modifier keys? I just tested this again. The left ALT key doesn't work, but the right ALT key does. So, maybe my analysis was wrong and there is a bug in our code. My suggestions to the help texts as diff. See https://wl.widelands.org/forum/post/16816/ for the result.